Information about Australian opal and Australian opal jewelry as well as new Australian opal jewelry designs from Hileman Jewelry. Dinosaur bone wedding ring set now available at Handmade at Amazon. Today Amazon officially launched Handmade at Amazon. Amazon’s new venture will feature handmade items from around the globe and we are pleased to announce that our Hileman Silver Jewelry line was accepted to be a part of this new marketplace. Amazon is only accepting artists and companies that offer handmade goods – no mass production items! At launch Amazon plans to offer over 80,000 items from artisans in all 50 states and 60 countries. The new marketplace will also offer more information about the artists and how they produce their goods as well as images of their studios. We are in the process of building out our new Handmade at Amazon shop but we invite you to stop by and check out our new home on Amazon. We believe our handmade dinosaur bone rings, turquoise engagement rings and Australian opal jewelry will be a big hit with customers looking for unique handmade jewelry. Visit Hileman Silver Jewelry on Handmade at Amazon! New Australian Opal Jewelry Website Launched! Australian Opal Jewelry by The Hileman Collection at www.TheHilemanCollection.com. The Hileman Collection just launched its new Australian opal jewelry website last week. Our new website TheHilemanCollection.com is mobile user friendly and includes a shopping cart for easy online purchasing. Stop by and browse our Australian opal rings, wedding sets, earrings, necklaces and bracelets. Check back often as we are adding new opal jewelry designs every week. Our old website will still be available for reference and viewing our opal jewelry portfolio. If you don’t see the item you are looking for on the new website contact us or the store nearest you for assistance and pricing information. We just completed this Australian opal his and her wedding ring set. The opal is set in 14k gold and accented by sparkling white diamonds. Beautiful blue-green Australian opal inlay surrounds two round brilliant cut round diamonds in each of these unique inlay wedding bands. 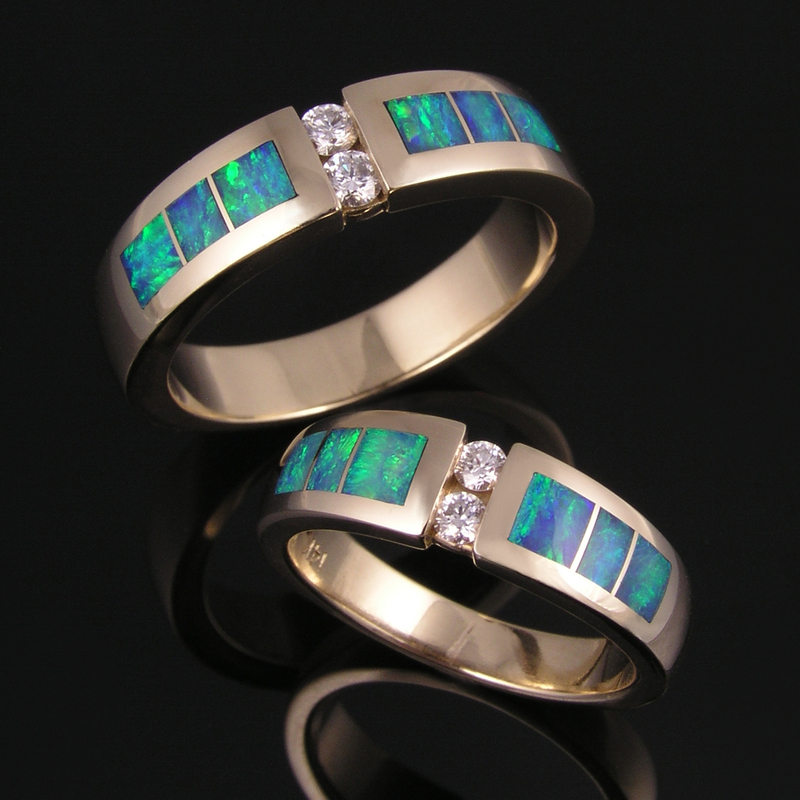 If you are looking for non-traditional wedding rings, then these opal rings are perfect for you. His handcrafted wedding ring has 6 pieces of Australian opal inlay accented by 2 channel set diamonds totaling .15 carats. The channel set diamonds are VS clarity and G color. His ring is 6mm wide and is a size 10 1/2. The ring is available in other ring sizes or 14k white gold by special order in 3 to 4 weeks. It is hand signed “MMH” by Mark McBride Hileman on the inside of the ring. Her handmade 14k gold and diamond ring band is also inlaid with 6 pieces of Australian opal. The Australian opal inlay in her ring is a perfect match to the opal in his ring. 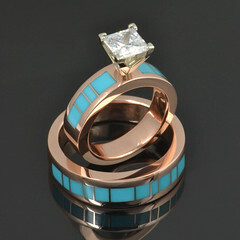 Her opal inlay ring features two brilliant round diamonds totaling .10cts. The channel set diamonds are VS clarity and G color. The opal inlay band measures 5.5mm wide at the top and is a size 6 1/4. It is available in other sizes and 14k white gold by special order in 2 to 3 weeks. 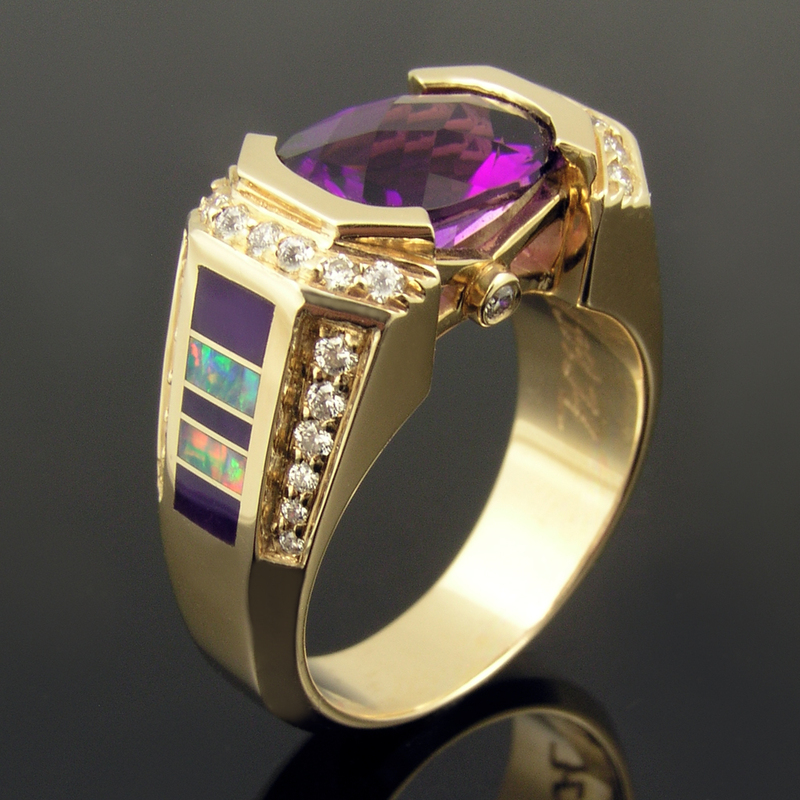 The ring is hand signed “MMH” on the inside by Mark McBride Hileman and stamped 14k gold. Either ring may be purchased separately or the set may be composed of his and his or hers and hers by special request. For more information about this opal wedding set or to purchase the rings, please visit our Etsy shop or contact us. If gold is outside of your budget, take a look at this similar his and hers wedding set in sterling silver with white sapphires and Australian opal inlay. You could almost call these opal rings one of a kind pieces because opal forms under such unique conditions, it is nearly impossible to find two opals exactly the same- even from the same opal mine. Opal is the only gemstone known to man to have the natural ability to diffract light. An opal’s color is created when the voids between the particles split light entering the stone. The size and alignment of the spheres and voids, as well as the light source, determines the colors produced. To view an opal’s color play at its best, the light source must be coming over your shoulder. An opal’s color can cover the full spectrum of the rainbow. The opal in this wedding ring set is high quality genuine Australian opal, not lab grown synthetic opal. 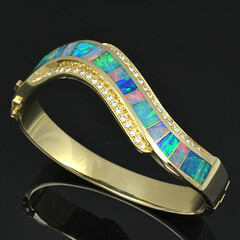 Check out more of our 14k gold Australian opal inlay jewelry at www.AustralianOpalJewelry.com or our sterling silver opal inlay jewelry at www.HilemanSilverJewelry.com. Follow us on Facebook and Twitter for updates on sales and new designs! Australian opal inlay jewelry is our specialty! We spend a lot time and effort promoting our sterling silver jewelry and sometimes neglect giving our gold jewelry equal time in the spot light. Actually, it is our incredible Australian opal inlay jewelry designs that the Hileman name is known for in the jewelry industry. 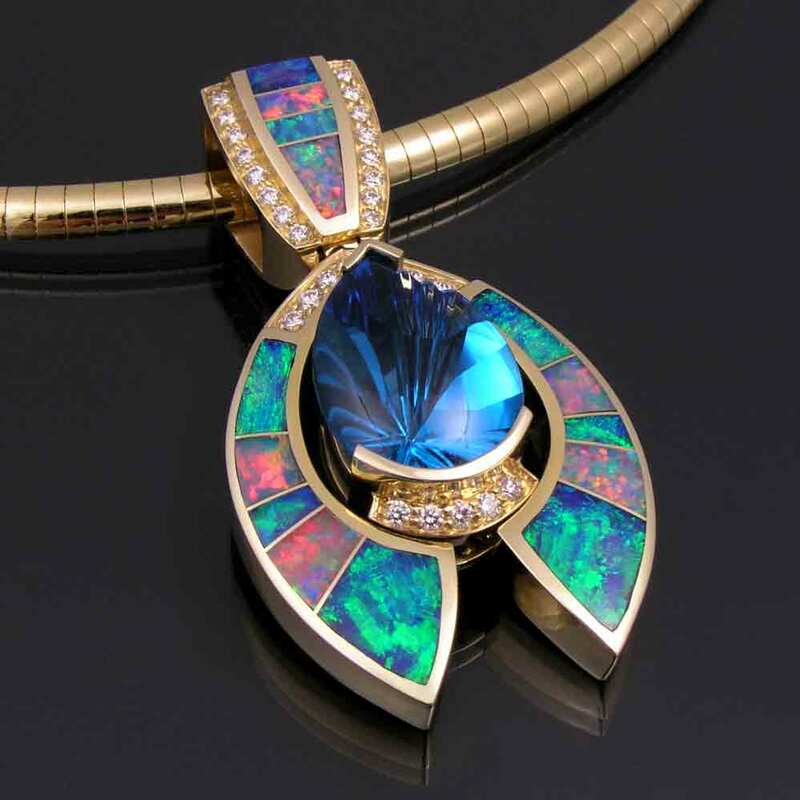 Hileman jewelry is recognized for the unsurpassed quality of the Australian opal and the superior craftsmanship used in creating our bold inlay jewelry designs. Our opal inlay jewelry can be found in the jewelry boxes of celebrities, CEO’s and opal jewelry collectors around the world. This remarkable opal pendant is a great example of our top of the line opal and outstanding workmanship. 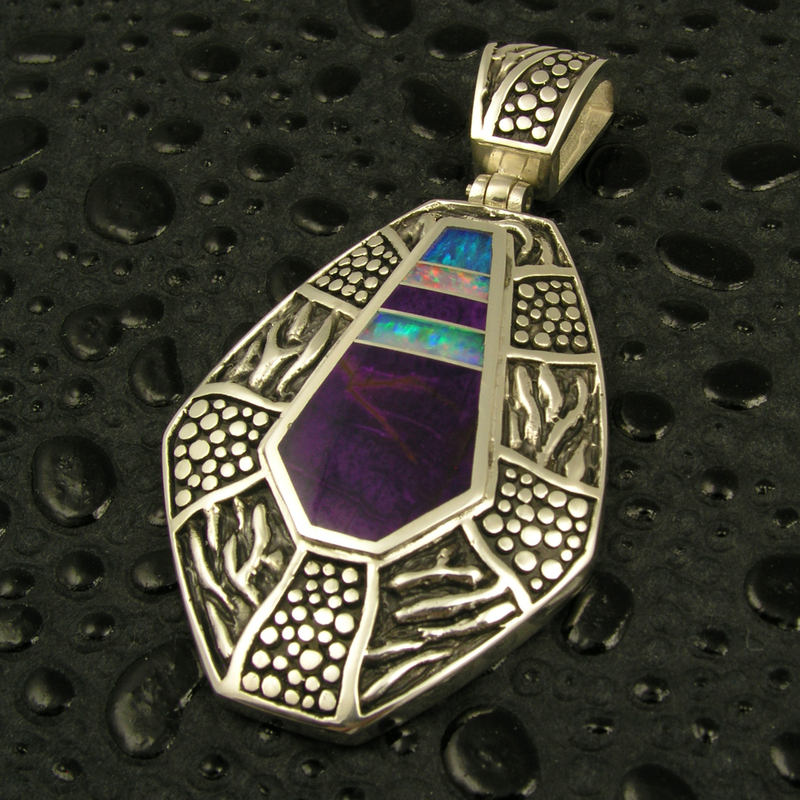 This handmade pendant is inlaid with the finest crystal opal Australia has to offer. 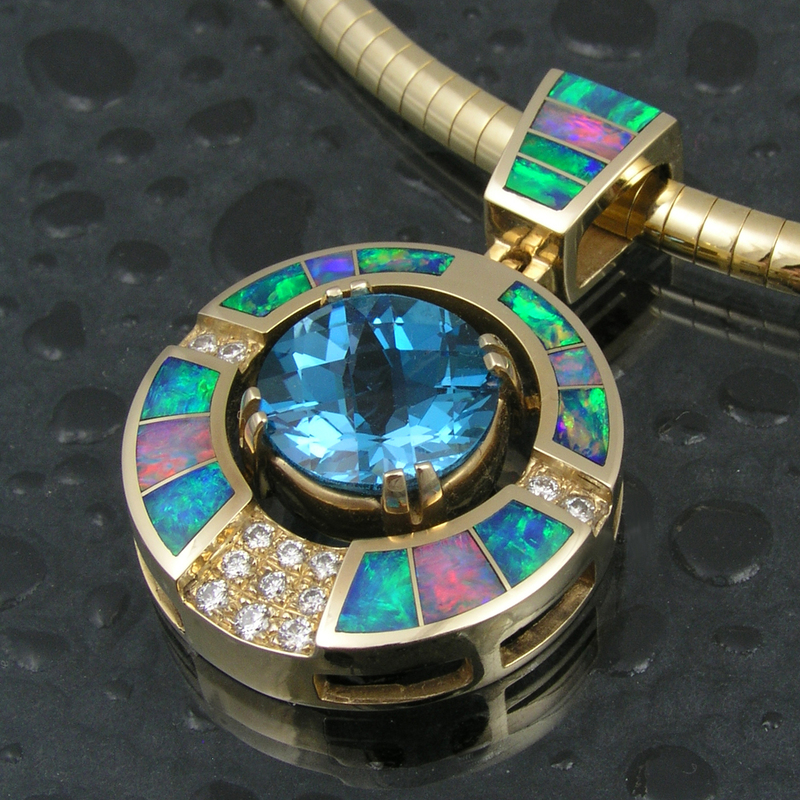 The pendant’s opal inlay alternates between bright blue green opal sections and red multicolor sections of opal. Opal of this quality is quite rare and is becoming harder to obtain at any price, making this pendant a real collector’s piece. 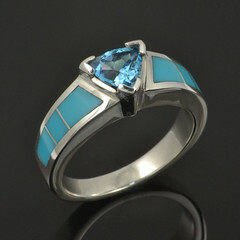 The center stone is a spectacular 13.25 carat shell fantasy cut Swiss blue topaz. The faceting on the topaz is very unique. The top is slightly domed with only one facet with the bottom has all the facets and notches to create the pattern viewed from the top. The opal inlay and topaz are accented by 28 pave` set diamonds. The diamonds are VS clarity and G/H color and have a total weight of .60 carats. Take a closer look at this amazing opal pendant at http://www.etsy.com/listing/58803270/australian-opal-inlay-pendant-with-topaz or visit our opal jewelry website at TheHilemanCollection.com . Thank you for supporting handmade jewelry artists!